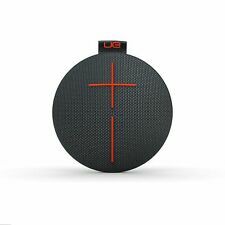 Ultimate Ears WONDERBOOM Portable Bluetooth Speaker (Fireball) NEW! Speaker only (as shown in the picture). We won`t be able to cancel order that already processed. Any Other Accessories. Enjoy clear and powerful music wherever you go with the Ultimate Ears UE BOOM 2 Portable Bluetooth Speaker. It has a 360-degree range to spread audio throughout the room or outdoor spaces. With a durable body, it's shockproof and waterproof, so you can safely take it to the beach or the pool. Tiny speaker, huge sound. The UE Wonderboom doesn't just sound good, it's impressively durable too. Rugged, water-resistant and buoyant, the UE Wonderboom has the excellent build quality and can withstand whatever life throws its way. 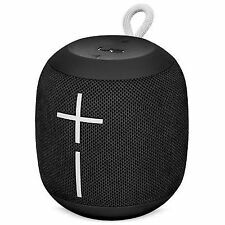 Logitech Ultimate Ears UE WONDERBOOM Wireless Waterproof Bluetooth Portable Speaker - Phantom Black. BLUETOOTH CONNECTIVITY - Connect to your UE WONDERBOOM using Bluetooth and keep on playing up to 100 feet (30M) away. Lagoon Blue. 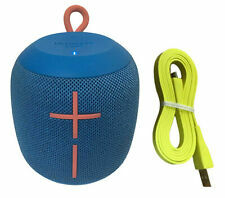 Type: Portable Speaker Manufacturer Color: Lagoon Blue. Ultimate Ears. Wireless Technology: Bluetooth MPN:984-001392. UE ( ULTIMATE EARS ). Ultimate Ears Boom 2 Is The 360-Degree Wireless Speaker That Blasts Loud, Insanely Great Sound With Deep, Powerful Bass In Every Direction–Everywhere You Go. It's Waterproof, Shockproof And Crafted From The Sexiest And Most Uninhibited Premium Materials In The Known Universe. Platform agnostic, compatible with Android and Apple. 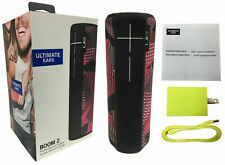 Ultimate Ears BOOM 2 Wireless Bluetooth Speaker. Ultimate Ears BOOM 2 is the 360-degree wireless speaker that blasts loud, insanely good sound with deep, full bass in every direction–everywhere you go. Now with Amazon Alexa built-in, you and your crew can blast tunes, discover new music, order takeout, and more, with just the power of your voice. With up to 12 hours of battery, it brings your music to life wherever you take it. UE Wonderboom. Color: Black. We work hard to provide the best product for you. Condition: NEW. Build a wall of sound?. No problem. BOOM 3 is purpose built to handle life's thrills and spills. It’s passed more than 25 seriously tough durability tests, including thousands of button pushes, 100s of tumbles, multiple drop tests, and more. Download the app to unlock cool, new features like a musical alarm, custom-tuning options and more. PartyUp from Ultimate Ears allows you to wirelessly connect more than 50 UE speakers. UE Blast Wireless Bluetooth Speaker. Waterproof and virtually indestructible: No matter how wild things get, your music will always be on point. Download the app to unlock cool, new features like a musical alarm, custom-tuning options and more. PartyUp from Ultimate Ears allows you to wirelessly connect more than 50 UE speakers. Freakishly amazing 360-degree sound with deep bass. UE - Mini Boom Model: S-00136 - Portable Wireless Bluetooth Speaker (Orange). The speakers are used but in good condition. We are very understanding and will do everything we can to resolve your issue. Speaker only (as shown in the picture). We won`t be able to cancel order that already processed. This item is new in the box. No PO Box shipments! Will ship Friday after sale. No returns, so please make sure you really want this. Compatible with: 1. 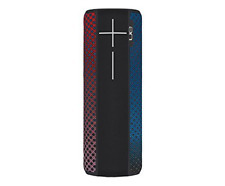 UE Boom 2. 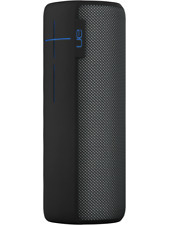 UE Boom2 3. UE Roll 4. UE Roll2 5. UE Wonderboom. This replaces UE AC Charging Adapter PN 534-000617 for Ultimate Ears UE Boom. Check-Out Now! 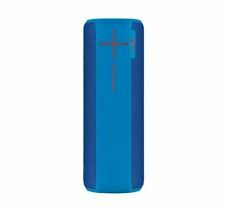 UE Boom 2 Wireless Bluetooth Speaker. Condition is Used. Comes with cord. Shipped with USPS Priority Mail. For Audio Playback - Smartphones, tablets and other devices that support Bluetooth® wireless audio profile [Advanced Audio Distribution Profile (A2DP)]. or 3.5 mm audio output. Phone Calls: Phones that support Bluetooth® Hands-Free Profile (HFP1.5). 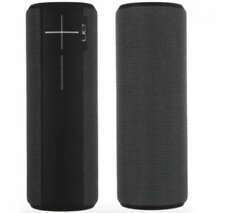 New Ultimate Ears BOOM 3 Portable Bluetooth Wireless Speaker - Night Black. Condition is New. Shipped with USPS Priority Mail. UE BOOM BLUETOOTH SPEAKER. USB Cable (Non OEM). 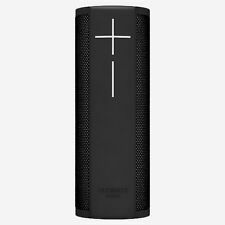 Logitech UE Boom Portable Wireless Speaker - Black (Pre-Owned). Take your music with you without the hassle of cords or headphones, with the UE BOOM Portable Bluetooth Speaker. It pairs easily with smartphones, tablets and other Bluetooth-enabled devices, giving you the freedom to roam while sharing your favorite tunes. Ue Roll 2 . Condition is Used. Shipped with USPS Priority Mail. Logitech UE ROLL 2 Black Volcano Wireless Bluetooth Speaker Black, NEW! SEALED! !